Survival bread used to be a common staple, and it still is popular today as a survival food. It can also be called other names like hardtack, pilot bread, and army bread. 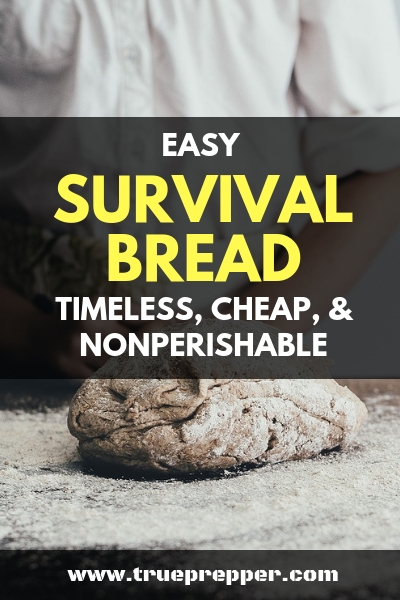 No matter what you call it; survival bread is a timeless recipe that can provide you with a cheap nonperishable option in emergencies. Preheat the oven to 350 degrees. Combine the oats, powdered milk, and sugar in a medium bowl. Combine water, honey, and Jell-O in a medium pan, bring to boil, and then remove from heat. Add the oat/milk/sugar mixture slowly and mix well. Shape the dough into a thin brick-sized loaf and put it on a cookie sheet. Bake the loaf for 15 to 20 minutes. Allow the loaf to cool and then wrap in aluminum foil. Food storage can be a major problem, and survival bread is just one of the many solutions to that problem. Our ancestors figured that out, as you can tell by survival bread’s storied history. Why reinvent the wheel when it comes to long-term food storage? The bread is shelf-stable and will stay edible indefinitely. The loaf is packed full of nutrients and calorie content- enough for one adult for an entire day. The loaf is very dry, but that is one reason why it has such a long shelf-life. Water can help make survival bread more palatable and easier to chew. One of names for survival bread is ‘hardtack’ because it can be tough to chew. Give the recipe a spin, and let us know what you think in the comments below. It sounds odd, but the Jell-O adds a little bit of flavor and helps the bread stick together in it’s hard loaf form. You can actually use whichever flavor Jell-O you prefer, but I like Lemon, personally, and think it goes well with the texture of the bread. It doesn’t serve up a tart dessert treat like lemon meringue pie, but it does the trick. The honey also does wonders with helping hold the loaf together and adding much appreciated flavor. It used to be widespread, but finding canned survival bread these days can be elusive. Every once in a while, you can find some online. You cannot control the moisture content in a pre-made product, obviously. In order to get the bread to come out of the can, they have to increase this moisture content- which has the drawback of giving it a shelf life. Still, the shelf-life is a whopping 30 years, which is a whole lot longer than typical bread. If you can find some online it may be worth picking up since it is so easy to add to your food storage plan. We check back periodically on Amazon for availability ourselves. In a world of fast-perishing foods, survival bread in a can must not make much of a profit for food producers since it is a scarce commodity now. 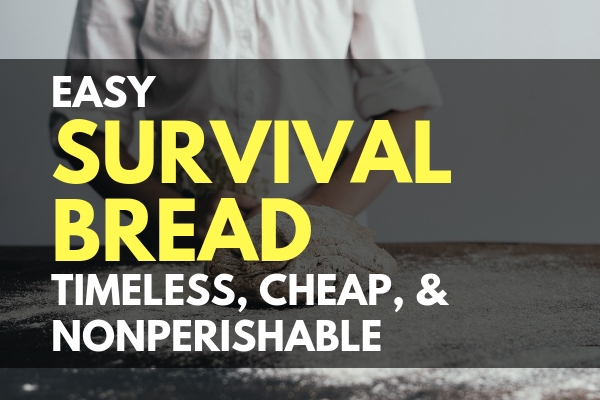 Survival bread is a great inclusion in any long-term food storage plan. You can tweak the recipe to you and your family’s liking to be sure that everyone enjoys the bread. 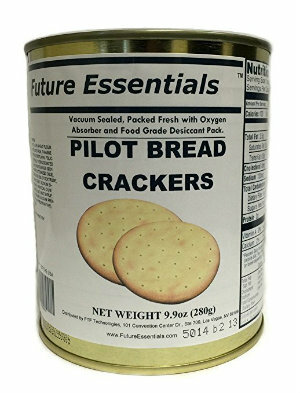 Break it out when you are heating up some MREs or canned goods as a side item. Pair survival bread with peanut butter for a great emergency snack. It is easy to make, tastes good, and is shelf-stable; add it to your plan. Keep exploring, stay prepared, and be safe. Would you recommend making a lot of these? After wrapping in foil, how would you store, for long term use? I recommend making a proportional amount to the other food storage you may have. It is good to have a balance of a variety of items. Ideally, you would want to store in an air tight container inside a dry pantry or storage area that remains below 68 degrees. If you don’t have perfect conditions for storage, just focus on keeping humidity and bugs away from them. I would think using a vaccuum sealer for ths would be good. Even packing it in a mason jar when cooking it would work; let it cool put a lid on and use the jar vaccuum sealer would remove all air and seal the lid for long term storage…..?